Appeared in World of Interiors see more photos over here. I’ve asked some of my favorite design friends to help me brainstorm ideas for my den. Lizzie who I met while working at House & Garden was sweet enough to participate. I miss the days of being able to pop over to desk and trade ideas and inspiration. She always had the best fabric samples! After H&G closed Lizzie attended Parsons to study Interior Design. She’s becoming quite the super star. Check out her bedroom at the Hamptons Designer Showhouse. This month her apartment is featured in the new online publication, Lonny. Way to go Lizzie! Below a brainstorm session with Lizzie filled with great tips, products and links. The two windows in question. Regarding the windows. I almost always love a floor length panel but in this case I do think that hanging drapes is problematic because you can’t install a rod above the header due to the moulding (which sits right on top of the window). Your walls are already getting truncated into 2 planes because you have this (amazing) chair rail/millwork and wood paneling below, assuming these will be painted a color different from the walls. In terms of paint colors, I definitely prefer the idea of all the trim green as opposed to the (more expected) green on the walls and creamy trim. Plus, I think a darker color on the bottom 3rd will anchor the room while keeping it airy which is nice since it’s on an upper floor of the house. I wonder if putting green on the upper portion of the walls and a paler hue on the woodwork below could feel top heavy? Then again I’ve seen this done to great affect – sure your readers could offer many instances to prove me wrong here! So I say go for green on the trim + paneling. Maybe wall color is a paler green? Loving Farrow & Ball Breakfast Room Green for trim and Tunsgate Green for walls. From left: indian pear white, sweet pea, and montpelier from Robert Kime. This could be a nice treatment for your two windows so each could be pulled away from the center beam/pillar that separates them. Still I’d stick with something sheer and not necessarily plain but with a small print and a print with some space between the design – keep it airy and a little organic (not geometric). Bernard Thorpe also has beautiful prints (available through Stark showroom here in NY) that come on a very wide variety of grounds including sheers. Not sure about price (probably expensive!) but if you’re not doing floor length drapes you won’t need as much yardage so maybe worth a splurge if you find one you love! From top: Peter Dunham, Muriel Brandolini, Carolina Irving, and John Robshaw. This could be a great place to put your floral upholstery since the wood frame and caning would temper the flowers a bit? Alternatively, a great distressed, beat up leather chair would also be a nice addition to your scheme and add some masculinity Obsessed with this one in Ali Wentworth’s house featured in Elle Décor. Love the distressed leather chair! From left: 1stdibs and 1stdibs. Leather Seat Arm Chair, $1,200, English Country Antiques. From top left clockwise: 1stdibs, Ikea, Jayson Home & Garden, and Mecox Gardens. I’m spent, and sure everyone but you and I got bored reading this so will stop. But maybe we can do another installment (lighting + accessories + flooring?!) Oh my!! 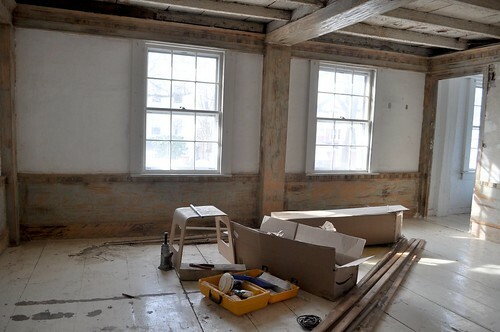 And you are going to invite me over for tea/drinks in this den once it’s done right? Thanks so much Lizzie for the fun inspiration. If you need help decorating a room, house, or apartment you can contact Lizzie at elizabeth.m.bailey@mac.com. Forget window treatments. The colonial thing looks better with no curtains unless privacy is an issue. If you must have fabric — a loose length of fabric over the top and about 6-7 inches down the side — just hung on widish hooks at the two upper corners of the window. But, fabric just gets DIRTY! I love unadorned historic windows. Wood blinds if you can’t run naked! love that you have the little ikea stool in the living room as part of the reno-zone. our is so covered with paint and plaster from all of the reno work we’ve done! I love that what one too! Great find Jennifer. beautiful ideas! you have such great taste and your house has such great bones that either direction will be lovely. Mitchell Gold use to make this great spindle side table but it was discontinued. I remember it being a knock off a more traditional “camp” table. Not sure if that’s the correct term. I have to keep searching. Great ideas! And I also love that Ikea spindle-leg table – I’m picturing it with a few orchids in blue and white pots near a sunny window. This was such a fun post to read. Even though I had voted on the side of white/cream trim and green walls, I do agree with Lizzie that going green on the trim would be more unexpected. I have been in love with those Muriel Brandolini prints for ever…and spindles, YES! Thanks, that was great. And that spindly thing is from Ikea? I can’t believe it. Love this post. Very inspirational and just my style!